DENVER, Colo. (Embargoed until 2 P.M. MT, Monday, June 12, 2017) – Cancer of the neuroendocrine system is a moving target with managed treatment aimed at palliative care rather than a cure. Patients with neuroendocrine tumors (NETs) may experience fewer symptoms and survive longer by undergoing peptide-receptor radionuclide therapy (PRRT) combined with a drug that makes tumor cells more sensitive to radiation therapy, say researchers presenting at the 2017 Annual Meeting of the Society of Nuclear Medicine and Molecular Imaging (SNMMI). The Canadian study evaluated lutetium-177 (177Lu)-octreotate PRRT, which has been found effective for slowing the growth of malignant peptide-receptor positive NETs. The challenge is that damaged cells can naturally repair their DNA, which limits the effectiveness of PRRT. By blocking a protein called poly(ADP-ribose) polymerase, or PARP, scientists can effectively override this process and induce more cell death—the objective being fewer and smaller tumors and longer lives for neuroendocrine cancer patients. The researchers used 3D spheroid models (proven superior for replicating human tumor growth), rather than 2D monolayer culture, for two separate human NET cell lines—one of gastroenteropancreatic origin and one of bronchopulmonary origin. These models were dosed for five days and then monitored for 15 days. Results showed that more NET cancer cells died when PRRT and the PARP inhibitor were used together than when they were used separately. The combined treatment led to significantly inhibited cell proliferation, and it increased programmed cell death. In the gastroenteropancreatic cell line, untreated control spheres increased in size by 16.7 times their original volume within 15 days. Spheres treated with 177Lu-octreotate alone grew by more than 5-fold their original volume, and those treated with only the PARP inhibitor grew 11-fold. Those with the combined treatment grew by only 1.9-fold. The bronchopulmonary cell line revealed 11.4-fold growth for untreated controls, 4.6-fold growth for spheres treated with PRRT alone, 3.5-fold growth for those treated with only the PARP inhibitor, and 2.8-fold growth for those treated with both PRRT and the PARP inhibitor. This method of combining 177Lu-octreotate and PARP inhibitors could be translated readily for improved management of peptide-receptor positive neuroendocrine cancer, because both drugs are already approved for use in cancer patients. 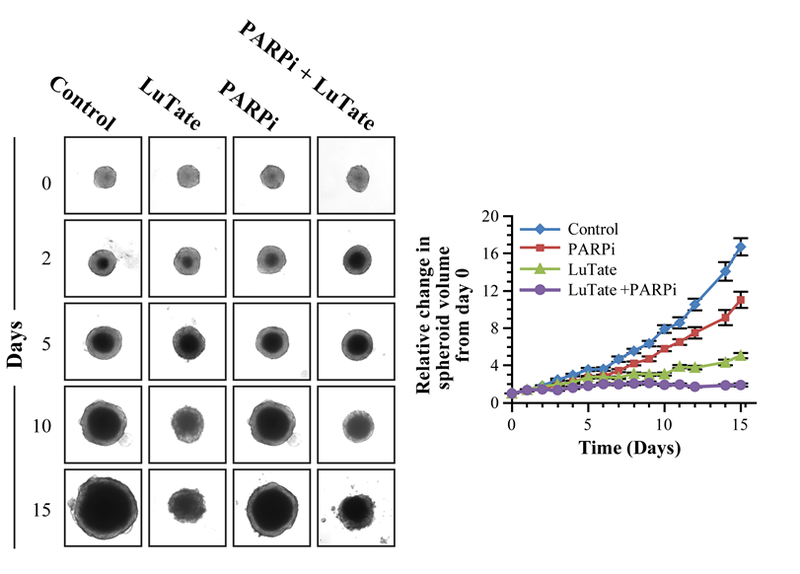 Scientific Paper 243: “Potentiation of 177Lu-octreotate PRRT by PARP inhibitors in a 3D spheroid model of human-derived neuroendocrine tumor cell lines,” Samuel Adant, Nupur K. Purohit, Rashmi G. Shah, Girish M. Shah, Jean-Mathieu Beauregard, Department of Radiology and Nuclear Medicine and Department of Molecular Biology, Medical Biochemistry and Pathology, Université Laval and CHU de Québec – Université Laval Research Center, Quebec City, Quebec, Canada; SNMMI’s 64th Annual Meeting, June 10–14, 2017, Denver, Colo.